Shepherd of the Hills family… Can I just tell you that it is nothing short of incredible to be standing here today with you all? It’s been a challenging, crazy-wonderful journey to get here. God has been in the midst of all of it—in amazing and mind-blowing ways. The love that you have already shown to us, the way you’ve welcomed our family… it’s humbling and awesome, and fills us with such incredible hope for our future together. I’ve heard it said that you can tell a lot about a congregation by the way it welcomes a new pastor. Well, I have to tell you that if the way you’ve welcomed us in any indication of your character, goodness, energy, light and life—we are in for an incredible ride together. I can't thank everyone enough for all of the kind words of welcome, the dinners that so many of you have been bringing, the cookies, goodies and so much more. We needed the love after our road trip here, to be honest. Don't ever try to travel with two kids, a dog and two cats. Just don't do it. You may think you want to do it. But I'm telling you that you can't. Today is the Second Sunday of the season of Advent. Advent is a season of expectation, and it seems fitting that we would find ourselves beginning a new journey together during this blessed time of year. 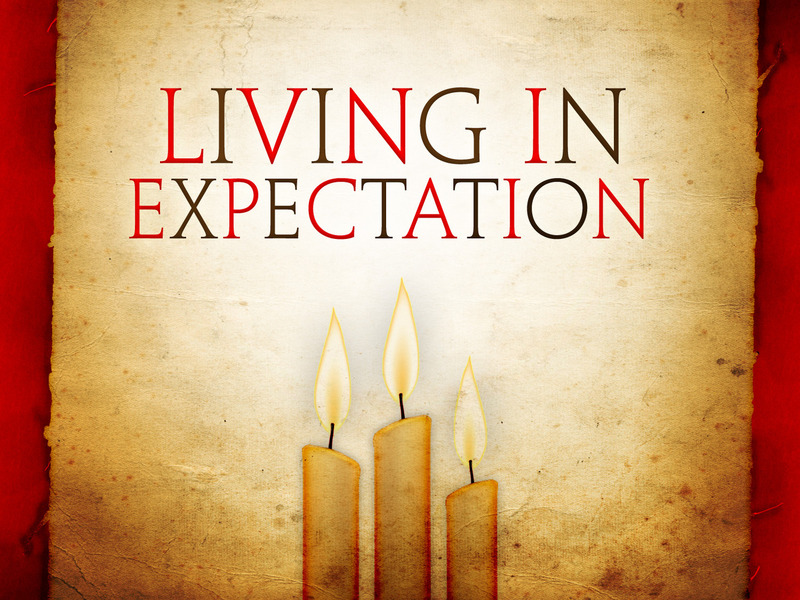 For the next few weeks I am going to be preaching a short sermon series entitled Living in Expectation. I feel like this is a timely series for our new beginning together, but also for us as a community of faith within the current climate of anxiety brought on by change in our society, uncertainty in what happens next, and the divisions that seem to be growing in our country. We need a good word right now, amen? Today I want to talk to you about what it means to live in the kind of expectation that leads to joy. We’ll be taking a look at the Gospel of Matthew chapter 3 verses 1-12 here in a moment, so if you’re the kind of church goer who likes to be ready—you can go ahead and get there now, if you want. But first, I want to share a bit of my story with you. One thing you’ll come to know about me is that I am not afraid to be my own sermon illustration—even when it’s not that flattering. What you see here on Sunday is pretty much what you get anywhere else. When I was 15 years old, I stopped believing in God. I lost my sense of eternal hope, and didn’t much care any longer about any of the things I’d been taught about the Bible, God, Jesus, salvation and all the rest of it. I was raised in a wonderful Christian home, but I didn’t believe any of the Christian stuff any longer, and so I bided my time until I was old enough to leave home and I did… in a hurry. My goal was to never darken the door of a church again. I broke down a few times when my mom would invite me to go to church with her on Mother’s Day, but other than that for about five years I never set foot in a church. Then I got married to the most beautiful, fierce, terrifying and wonderful woman—my wife Merideth. She declared that we were going back to church. I declared that I was never going to set foot in a church ever again. She said, what if I can find a good church. I gave her a long list of the kinds of churches I never would attend. I forgot to put Presbyterian on there, though. So we went to a Presbyterian church. I remember sitting there on the pew listening to the pastor preach about grace, and how God loved me. I remember how those words fell on my like a ton of bricks. I started crying and couldn’t stop. I think I cried every Sunday for three months. I discovered I couldn’t wait to go to church on Sunday, I was living in expectation for the first time since I was a child. And it changed everything about me—even though it would take years for the full effects to be realized. When I embraced that expectant living, I discovered a newfound sense of joy as well. Joy that I hadn't felt in a very long time. We all need this now more than ever. It’s time for us to put aside our fears and dreads for tomorrow—to rediscover what it means to live in expectation of Jesus all of the time. For the next few weeks we're going to be learning together how living in expectation of Jesus can change your life, your outlook and can strengthen you faith even in uncertain times. We're going to learn how living in expectation can lead us to joy, peace and love. Today we're going to begin by talking about joy. So, since this is my first sermon I want to make sure that all of you know how important I think it is that a sermon actually has a point. I typically just have one point, and it typically helps answer the big question that ought to come at the end of every sermon: So What? So, if you remember nothing else that I say today, I want you to remember this: Living in expectation leads to joy. Let's take a look at the Scripture passage for today, which is found in Matthew 3:1-12. I know, I know, this sounds pretty harsh doesn't it? John the Baptist doesn't pull any punches. To the 1st century reader of the Gospel, John appears on the pages just like Elijah appeared out of nowhere in the Old Testament. And right away, John starts speaking truth to power, and calling people out about their faithlessness. But when you get your arms around the prickly way he delivers these words, you start to realize something--what John is proclaiming is nothing but straight up words of deliverance and love from God. The Messiah, the Promised One was coming, and the world was about to be changed forever. God's love was about take on human form in an unmistakable way. And John tells them--the time has come to start living in expectation, and to experience the joy of your salvation, but it's going to cost you. It's going to require something of you. You can't live the same old way any more. You can't live your life as though God wasn't a part of it. You can't live selfishly---you have to start living selflessly. You have to let go of all of the things that are keeping you from being everything that God dreams for you to be. I wonder how many of us find ourselves in a similar situation to the one those first century spectators of John the Baptist faced. 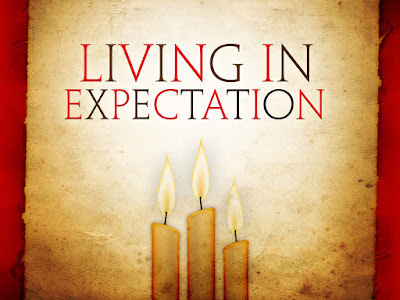 Where in your own life have you lost your sense of expectation when it comes to Jesus? Maybe you are facing a serious crisis in your life right now--and you've stopped expecting Jesus to show up in the midst of it. Maybe you find yourself expecting the worst--even though you know you should be hoping for the best. And all the while we have the words of John the Baptist echoing through the centuries--"Prepare the way for the Lord! Pull yourself together! What are you thinking? Stop your moping! Start living right! Start expecting the unexpected because the unexpected is here! God is moving, the Messiah has come, you're about to be baptized in fire and the Spirit--come on!" What is more joyful than living without dread, without fear, with expectation that God is near and that you are ready to experience whatever God has in store for you? Child of God---you cannot, you must not let anyone or anything steal your joy by stealing your ability to live in expectation. It isn't there's to take. What would it look like if the Church figured this out? What would it look like if as Christians we all started living in expectation that Jesus was near--the kind of expectation that led to joy unspeakable and full of glory? I guarantee you, people would find a way to make it to church, don't you? I know I did. I was an angry, negative, de-churched so-and-so who never wanted anything to do with church or church people ever again. But I made the paths of my soul straight, and discovered Jesus on the way. And oh, the joy I've had since then, beloved. Because, living in expectation leads to joy. It leads to joy. Let's live in expectation together shall we, my new beloved congregation?